Since 1921, people have come into our door expecting to find a wide variety of beautiful floor coverings. They keep coming back because of the service they receive. When you visit our store, you’ll find the leading names in floor covering but most importantly, you’ll find honest advice from our people. We will ask where you live, about your lifestyle and how many people are in your family because we understand that you’re not just looking for floor covering – you’re looking to enhance the value of your home and the quality of your life. I joined Kermans in June of 2010 with almost three decades of sales experience along with extensive knowledge and experience not only in the Custom Home market but in the last eight to nine years in commercial business. I understand the value of constant communication with general contractors who are always under time constraints when managing projects. Availability and on site presence is essential when installation deadlines have to be met. I really appreciate that Kermans understands the importance of customer service and challenge me to hold to that value. In my off hours, I enjoy my family and friends and going fishing with my son Chris. Chris is active in TaeKnowDo and a member of Team USA, which allows our family to spend a lot of time together going to his tournaments and workouts. 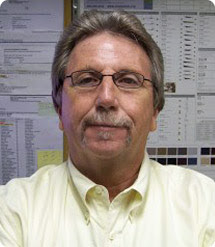 George is an important part of the Kermans Advantage – unparalleled service and knowledge backs up every sale. Whether you are carpeting a mansion in Carmel or looking for an area rug for your first home in Fishers, you’ll experience the same attention, care and exceptional result. Learn more about Kermans. Don't just take our word for it, visit our showroom on Indianapolis' northside - designed with interior design in mind. When you get there start with one of our design consultants, they'll be happy to share with you how they've helped families in Greenwood, Geist, Zionsville and all over Central Indiana.